As far as celebrity relationships go, there’s one in particular that currently has everyone riveted — and it just got even sweeter. Because during a visit to The Ellen DeGeneres Show on Wednesday, U.S. 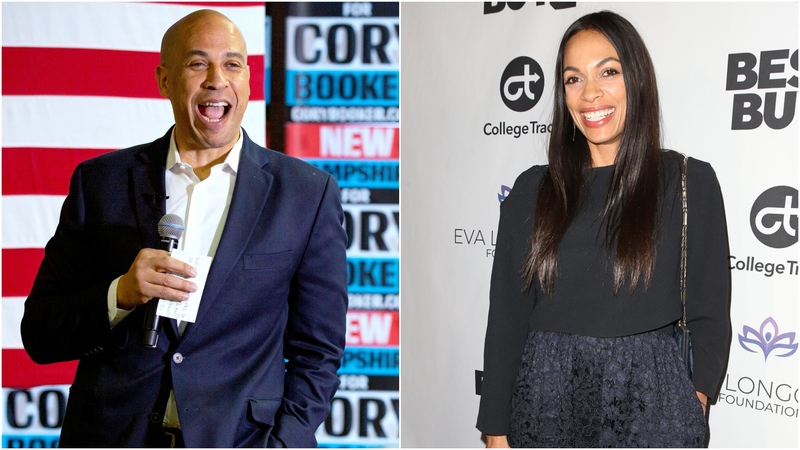 Senator from New Jersey and presidential hopeful Cory Booker shared how Rosario Dawson has changed his life, including crediting her with making him a better person. All eyes have been on the pair since she confirmed their relationship last week, roughly one month after Booker announced in February that he hopes to secure the Democratic nomination for the presidential race in 2020. In addition to Dawson’s prior remarks about her and Booker’s relationship, Booker’s conversation with DeGeneres on Wednesday certainly seems to suggest these two are getting serious. Now there’s a platform we can all get behind, right? Fearless love: we like it! And if that sentiment truly does permeate Booker’s campaign, we’ve apparently got Dawson to thank for it. Although this is the first time Booker has publicly opened up about his relationship with Dawson, rumors have been swirling around the pair since the beginning of the year. Neither of them dropped any hints about the length of their union yet, so it’s unclear just how committed they are to this relationship (although Booker didn’t exactly object when DeGeneres suggested that January 2021 was the perfect date for a wedding). Still, with Booker running for the highest political office in our country, it’s only natural to wonder what such a nomination could mean for Dawson should their relationship continue. Career-wise, Dawson would undoubtedly have to scale back her acting projects if she and Booker got more serious in their relationship. She’s stayed pretty busy over the last few years, shooting Luke Cage for Netflix. She also currently has two TV series and two films in various stages of production, per her IMDb page. If she’s going to hit the campaign trail hard and in the official capacity of Booker’s partner, she might have to start saying no when scripts are sent her way. Dawson has also embraced political activism and is already one of the celebrities people look to for political commentary. In 2016, she was arrested for protesting against voter suppression and corruption. While she certainly has strongly-held opinions that she shares on social media, that might actually work in Booker’s favor as his campaign progresses, especially considering Dawson leans towards the more liberal side of the political spectrum. Dawson’s political activism aligns with Bookers such partisan issues as climate change and human rights abuses.